The new method goes by the name of “Project Approach” which describes a new melding of teaching and learning styles for younger students. 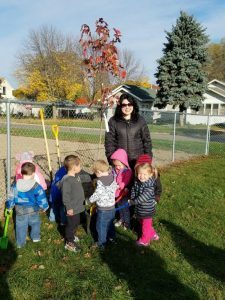 Sherry Bredehoeft is the teacher of the four-year-old pre school class at Emmetsburg Catholic School, and implementing the program has provided new and exciting opportunities for her young charges. 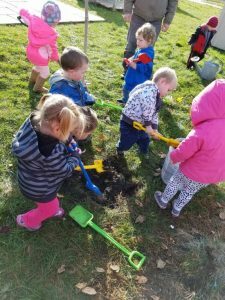 Through the study of snow in the classroom, the pre-schoolers had chances to see what happened when snow would melt or freeze, but one thing they’ve been cheated on so far is building a snowman. “It’s called Teacher Provocation – with the photos of those machines, it sparked their interests and made them want to learn more about how those machines removed snow,” Bredehoeft explained. 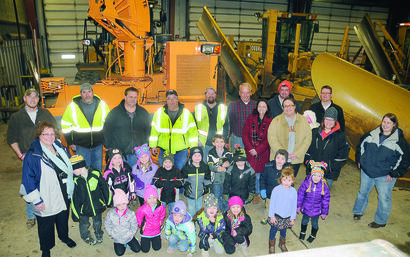 The student’s questions were answered through their visit, with the various county workers providing the answers – “Very carefully!” was the response on how one learns to drive a snowplow. In the course of their visit, the students were able to climb inside the large front-end loader, watched a motor grader start and saw how the blade and wing blade operate, and then were able to climb into the grader’s cab. The wing blade and snow plow on a tandem dump truck were demonstrated, and the students got to sit behind the wheel of the big truck and honk the horn. The students also saw the sign truck and ventured into the mechanic’s shop, where Pat Madsen demonstrated the large hoist by lifting a dump truck as the class watched. But after seeing the various pieces of equipment, each student was given a clipboard to draw a piece of equipment they’d seen – all part of the educational aspect of the trip. Does a turkey fly? Why does that millipede have so many legs? How do seeds turn into plants? Nature has its share of mysteries and many of them can be solved through the Young Investigators program. The new curriculum approach is led locally by Lakeside Lab in conjunction with funding from Friends of Lakeside Lab. It is designed for early childhood educators and dozens of teachers from northwest Iowa have been through the program. Educators draw on a student’s sense of curiosity by allowing them to help develop lesson plans and steer their learning. The program stresses the importance of getting kids out-and-about through hands-on learning. “The Young Investigators program was created (three years ago) to provide teacher development for early childhood educators,” said Lisa Roti, executive director for Friends of Lakeside Lab. The three year program is meant to have the teachers continually implement what they have learned in their everyday teachings. “High quality development is something that needs to be repeated and developed over time, it needs to be practiced,” Roti added. The teachers participating in Young Investigators are taught to heavily rely on the students. Past projects local teachers have incorporated include the life of a turkey and how they survive or holes and which animals use them for shelter. Students also investigate seeds, trees, water and insects. To further nature learning, Roti said it is vital to call on outside resources. The Young Investigators program is a significant commitment, but Roti has been impressed by the response from teachers. On average 70 people attend the sessions — including faculty members from schools including Okoboji, Spirit Lake, Algona and even Humboldt. During the first year of the three-year program, teachers, administrators and assistants attend four different training sessions at Lakeside Lab. The second year they return to Lakeside Lab for two more sessions and in year three they come back for one more refresher course. They learn about the curriculum and what advantages there are in changing their approach. To make sure the educators are using what they learned from Lakeside, they are required to produce two nature units a year and journal their successes. Young Investigators pushes teachers away from relying on the course plan they have created. Roti, who is a former teacher in the Spirit Lake School District, understands the challenge of keeping students engaged. She believes practice makes perfect. Nature is the main focus of the training. Roti tries to get kids outside the four walls of the classroom — a concept she feels is escaping the younger generations. The faculty teams draw from the teachings of national speaker, Judy Helm, who was one of the originators of the Young Investigators. Young Investigators operates under the umbrella of the Nature Connections program at Lakeside Lab. A group of faculty members and local educators work together to improve nature education. 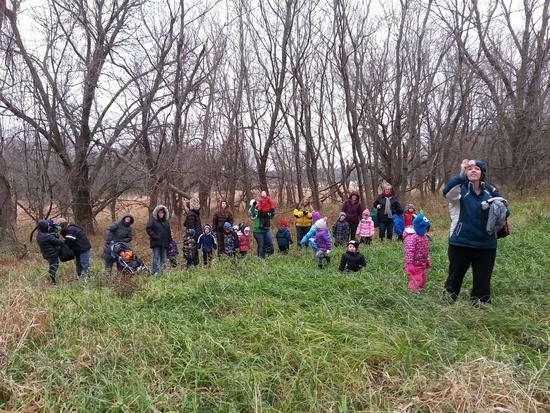 Nature Connections is funded by the Friends of Lakeside Lab and a REAP-CEP grant that has provided $40,000 in funding. At the moment, the Young Investigators program is primarily focused on Pre-K educators but the future of the program is bright, Roti said. The more success they see as a result of the training the better they can adapt it. Roti has been pleased by the response of the area educators. The next step is to take the training even further and expanding its reach, Roti said. Young Investigators is something that Roti has seen make an immediate impact in just three short years. The input from children helps it succeed.